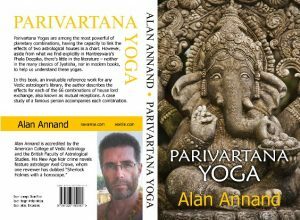 Parivartana Yoga, by Alan Annand, Sextile.com, 2015, paper (252 pp) $14.95, digital $6.99. I was very excited when astrologer Alan Annand (who also writes a series of astrological mysteries) sent me a copy of Parivartana Yoga, since in my own Indian astrology practice, I have lectured often on the significance of this planetary combination known to Western astrologers as mutual reception. I was not disappointed since this topic, which is very easy to understand, has often been glossed over as insignificant, and as Annand shows us, that is far from the truth. In Indian astrology a yoga (“union”) occurs “when two or more planets are joined in a specific configuration” (p. 3) and Parivartana (“exchange”) Yoga occurs “when one planet occupies a sign whose lord is in the sign ruled by the other planet.” Therefore, if Venus is in Aries (ruled by Mars) and Mars is in Taurus (ruled by Venus), you have Parivartana Yoga. Annand proceeds to list and interpret the 66 planetary combinations by house, so that the chapters are in sequential order: “Exchange of 1st and 2nd lords,” Exchange of 1st and 3rd lords,” etc. Each one provides a general description of how each house exchanges or identifies with the other, a list of famous people with this yoga, and a case study of one person. The research is impeccable and methodical, and shows the author’s ability to be as thorough as possible and to communicate his ideas in a concise, clear, and user-friendly style. I commend all the work that went into it. I also applaud Annand’s usage of the three categories of Parivartana Yogas: Maha Yoga, which involves an exchange between two of the following houses— 1st, 2nd, 4th, 5th, 7th, 9th, 10th, and 11th; Khala Yoga, involving the 3rd, and Dainya Yoga involving the 6th, 8th and/or 12th. Many astrologers do not use these three distinctions, since they are not found in every classical text, but they undoubtedly illuminate which houses are positive and which are problematic. This book is written for students and practitioners of Indian astrology, but even a Western astrologer can benefit from this book, since it is very easy to convert the Western chart into the Indian one. 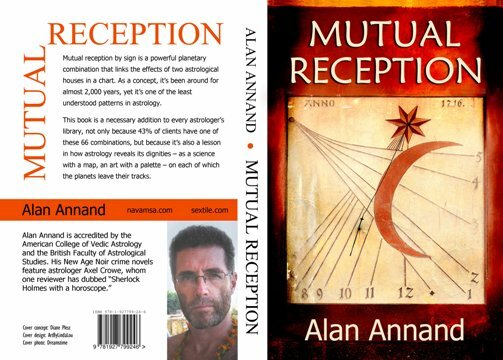 The good news, however, is that the author has also written the western counterpart of this book: Mutual Reception, by Alan Annand, Sextile.com, 2016, paper (339 pp) $19.95, digital $6.99. The format of this book is basically the same as Parivartana Yoga in that it includes the 66 planetary combinations and uses most of the same examples. The difference is that the interpretations include Western aspects and circular charts, though still using the Indian method of sidereal astrology and whole sign houses. Annand has also utilized the five classical receptions, which, in addition to reception by sign, include reception by exaltation, triplicity, term, and face. If you use both Indian and Western astrology in your practice, then purchase both these books. Otherwise choose the one that best suits your interests. Either way, you will be in a win-win situation with these informative, well-researched, and well-written books. 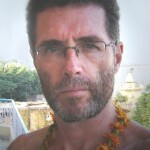 Alan Annand is a Canadian astrologer and palmist accredited by the American College of Vedic Astrology and the British Faculty of Astrological Studies. For a compilation of his writings (astrological essays on time-tested techniques, in-depth celebrity profiles, and analysis of mundane events) see his book Stellar Astrology.